CONSOL Energy Inc.’s headquarters, located in Southpointe near Canonsburg, Pa., has become the first building in the business complex to be LEED (Leadership in Energy and Environmental Design) certified. Known as CNX Center, the 309,000 square-foot building was designed to be energy-efficient and compatible with the environment by including multiple features required for the LEED certification, such as public transportation stops close to the building, bicycle stalls for employees, an exercise facility and showers. During construction, local materials (obtained within a 500-mile radius), low chemical emitting paints, adhesives and carpet, and wood certified to Forest Stewardship Council (FSC) standards were utilized. The project team also recycled more than 75 percent of all waste, diverting it from the landfill. Overall, the water usage in the building was reduced by more than 20 percent when compared to similar buildings. Native landscaping was also designed and installed to reduce the irrigation system demands to utilize 50 percent less water than the calculated mid-summer baseline. A roof garden also reduces heat gain and provides a serene setting where employees can gather. With the building serving as CONSOL Energy’s corporate headquarters, a Welcome Center for visitors was included that displays company artifacts, provides interactive displays that highlight the company’s history and its various business units. The Welcome Center also has a small theatre and a computerized mine tour. Occupancy sensors ensure that lights are turned off when offices are unoccupied and lighting controls for the building’s interior and exterior lights enable lighting to be reduced during non-peak occupancy times. Skylights provide natural lighting to a portion of the building, thereby reducing electrical costs. High performance windows and sunshades (on the exterior of the building) are utilized to reduce the impact of sunlight and reduce the building’s thermal load. Combined with other energy-efficient initiatives within CNX Center, CONSOL Energy anticipates an energy savings of roughly 18 percent annually, reinforcing CONSOL Energy’s commitment to the environment. CONSOL Energy takes its environmental stewardship very seriously and we are extremely pleased to have been able to be the first company in Southpointe to receive LEED certification. 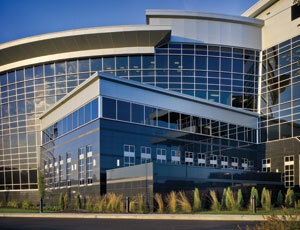 We designed our company’s headquarters with a commitment to conserving our natural resources. Often – small things like reducing water usage or planting a roof garden can have the biggest impact on lowering costs and sustaining the environment. I am confident our efforts have paved the way for other entities to build and operate sustainably. The irony is too huge. Wow, this takes “green washing” to a whole new level. While the irony is definitely there, but an 18 % energy reduction is an 18 % energy reduction. We need more office buildings like this, no matter who is building them. While this is ironic, I agree with Bill as well. We need more buildings like this one. An 18% energy reduction also equals savings on the energy bill as well. That will be a huge motivating factor in the decision to build “green buildings”. As electricity prices continues to rise, more people will realize this if they are informed. I hope the WV Legislature wakes up and smells the coffee on LEED Certification. Consol and the gas companies don’t give a hoot about the environment. The gas companies have polluted many creeks and rivers in N.W. Texas to the point of killing nearly every living creature in the creeks and now they are in the process of polluting the rivers and creeks in PA, WV and surrounding states. Sept. 2009, Dunkard Creek was polluted from Consol pumping stored gas well frac fluid into Dunkard Creek to the point of killing nearly every living creature in the creek. Even though this massive kill took place, Consol continues to pump frac fluid into the creek. With 7,000 gas wells slated to be tapped in our area, all of our environment is endangered. They did this because building to modern efficiency and conservation standards makes financial sense. Over the life of the building they will save far, far more money then anything extra they spent for LEED certification and the “green” features. If WV is serious about clawing its way up the state rankings, we ought to do everything we can to encourage buildings like this in our state, too.